Happy Monday, I hope you all had a wonderful weekend! Thanks for stopping by, xo!! Love love love this look! Including the dress, it is so cute! Love those shoes with the lace! That dress looks gorgeous on you and I love it paired with the Valentino heels! So pretty! Fabulous shoes and dress! You look gorgeous! Such a classy look ! Love it ! I love the colors of that Ann Taylor dress! I love that it can be worn for so many occasions, and dressed up or down! I’ve never seen those Valentino heels in that color combo before but I love it! I usually love anything pink though… The dress is really pretty too. I cannot wait to style my dress after seeing this! I love the pink heels- never would’ve thought to pair it together with the dress but it looks amazing! The dress is amazing and I love your shoes!! Sooo in love with your dress. Today on my blog get 15% off astrid & miyu jewellery, come take a look! love those shoes – I NEED them!!! great outfit. Gorgeous! 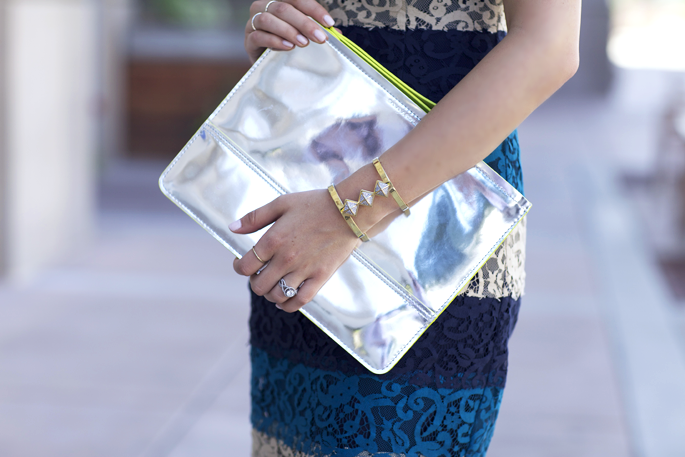 That dress is so unique, the clutch is so unexpected yet a fabulous addition to the look! I’m in love with your dress, i’ts absolutely amazing! I already wanted this dress…seeing it with the pink heels might put me over the edge! that dress is very pretty! That dress looks like it was made for you! You look so pretty in it, and I cannot wait to see more from you this week! I’m loving lace dress! You look fab! This dress is so pretty! Love the pink shoes paired with it! You look gorgeous Rachel! I love the unexpected pink shoes with this fun dress. Love the lace, and that it is such fun colors. Also love the fun unexpected shoes! You are darling! The dress fits you perfectly! Shows off your stunning figure. And that clutch is such a fun addition to the look. I love all the ways you style your hair but it looks so gorgeous straight. Beautiful post today, Rach! That dress is gorgeous—such pretty lace detailing! Love the pop of pink in your shoes. What a lovely look. Really liking the Valentino’s! I always say the more lace the better! :) Love your dress. all that lace + those sunnies are amaze! love the lace! i have a dress the same cut as that in lace & it’s quite versatile – i use it often! This dress is so lovely, I love these colours together. So beautiful! I love anything with lace! That dress is so pretty. You look beautiful! Beautiful dress! Love the pink shoes! The dress is gorge – but even more so I can’t take my eyes off the shoes! Love the hot pink! You always look aazing girl! this dress is so gorgeous– love it! This is so unique, with the lacey colors! That dress is such a great cut! I love the matching lip and shoe!! So cute! Love the outfit! The bracelet is sensational!!! That’s such a lovely lace dress! I am a big fan of lace. Those pink shoes are making me drool. Adore!!! that dress is so pretty!!! i love it! I LOVE this look!! It is stunning and you are glowing!! That dress is stunning! I have a hard time finding beautiful ones with sleeves so thanks so much! What a lovely dress! Everything looks so great! I’m in love with this dress :) so gorgeous!! I’m in love with the bracelet! That dress is gorgeous! Lace is my fave. Gorgeous dress! Look perfect with those shoes. I love the dress!!!! Do you know is it still available at Ann Taylor?? Thanks! !